You've got to love it when beads just fit in the right way. 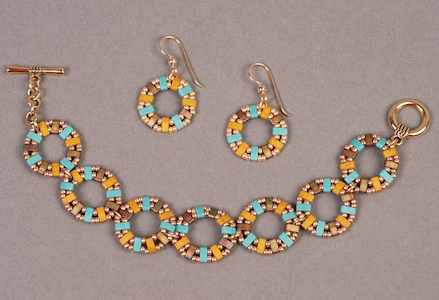 Check out this half tila circle beaded jewelry tutorial by Monica Lopez on Caravan Beads. Two of the Miyuki seed beads on the outer curve just countered the single beads in the inner one. Perfecto! I love how the designer easily linked several circles for the bracelet. It is very pretty when worn. The colors are also lovely but you could easily come up with different color schemes of your own. The half tilas also fit rather well with themselves with some 15/0 seed beads. This creative half tila bracelet video tutorial is by cristalpan features the herringbone stitch. There is no spoken Italian so no translation is really necessary. Another easy half tila beaded bracelet video tutorial is by Megan Milliken for Beadaholique. She uses brick stitch to combine the half tilas and offset them for a wavy racelet design. Even though I don't do this type of work (how many times have I said this?) I went and had a look at that first bracelet to see what it looked like on. I agree with you - it looks great on! I can imagine all of these in different colourways - especially since there are SO many different colours of beads out there. It's almost hard to choose with the variety you can get now.